McClelland Barclay was a talented and prolific artist. His heyday was the 1930’s and 1940’s, when he did illustrations, Hollywood movie posters, and advertising work. He also has a studio that produced small bronze figurines. These are now highly prized by collectors, especially the bookends. The majority of the jewelry McClelland Barclay designed was produced from the mid 1930’s to early 1940’s. His designs represent much of the best of vintage jewelry. He was influenced heavily by Art Deco, and we see the stylized lines and fine workmanship so representative of all of his work in the pieces we’re showing today. During World War 2, Barclay used his artistic talents to help the war effort. He helped by designing camoflage for airplanes and recruiting posters. Unfortunately, he did not survive the entire war. The ship he was serving on was torpedoed in 1942. 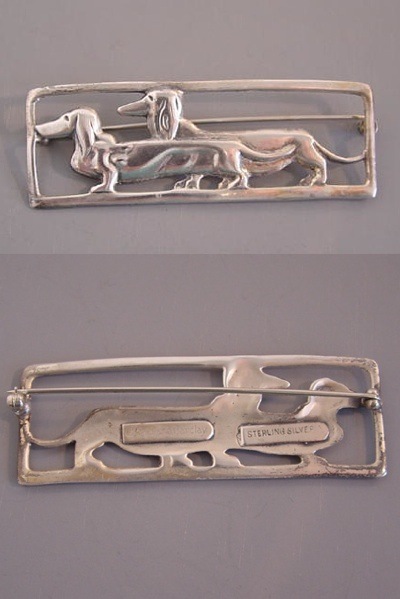 This sterling silver pin is elegant and perfect for the dachshund lover. It’s nearly 3 inches long and an inch wide: perfect for your lapel. You can see Barclay’s love of art deco here: the dogs are graceful and elegant with a natural, organic feel. We love the patina on this pin: you can tell it’s been loved! It’s in excellent condition. If you’re looking for an excellent piece of vintage jewelry, you need look no further! This sterling silver pin features exquisite detailing. We love the pair of hunting dogs. There’s a setter and a retriever here, eagerly looking for ducks! Great vintage jewelry from an American artist. Give a one of a kind gift!